High Roller is one of the rarest suris in the United States, being one of only very few medium fawn full Accoyo herdsires. 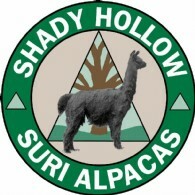 He stands as an example of the quality of the animals owned by Alpacas of Greater TN, and the Accoyo Partners, LLC, the largest full Accoyo suri herd in the United States. High Roller is one of the darkest full Accoyo suri herdsires in the country. His blanket is uniformly medium fawn with parts of his neck and his top knot being dark fawn. Both his parents are outstandingly nice imports, making him very interesting to breed to all those other nice Accoyo or non-Accoyo bloodlines out there. His sire is the famous Jackpot who passed on to his offspring not only color but also superior fiber quality an dgreat conformation. High Roller's dam is Selma, a tall and conformationally very correct white female that lets color through. High Roller's fiber has a soft, cool handle and is dripping with luster. It is very dense and shimmers bronzen in the sun. High Roller's Crias are doing very well in the show ring. Look for his crias next Fall. High Roller just gave us a LIGHT BROWN FULL ACCOYO MALE. High Roller is standing stud at our farm in TN, as well as at each of the members of the Accoyo Partnership. Contact us today to discuss this breathtaking young herdsire. 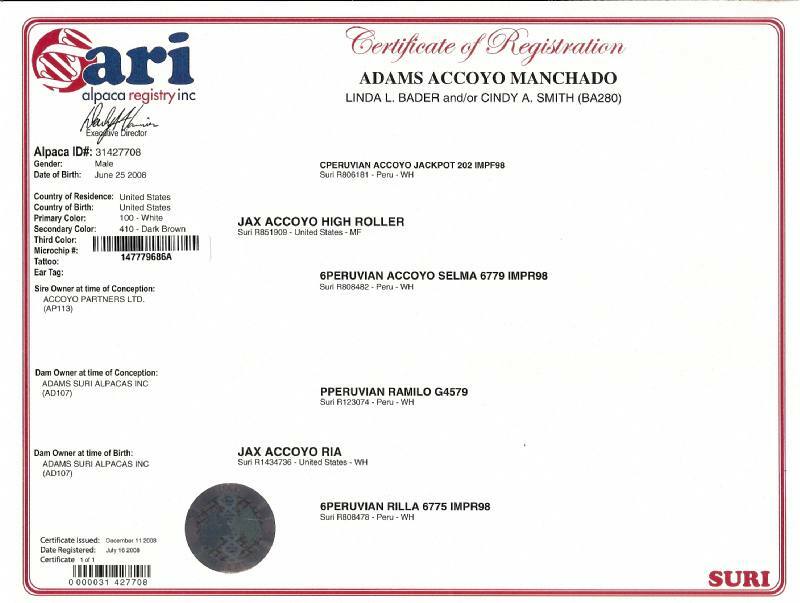 High Roller is proudly co-owned with the Accoyo Partnership. 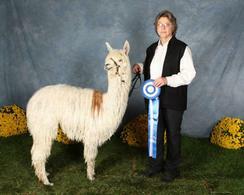 High Roller is home at Alpacas of Greater TN for the rest of the 2012 breeding season. In our recent herd classification done by Susan Tellez, High Roller scored: 4.0 for Luster, 4.5 for Fineness, 4.5 for handle, 4.0 uniformity of Lock, 4.0 Density, 4.5 Uniformity of micron, 3.5 color, 5.0 balance, 4.0 legs, and 4.0 substance of bone!!! High Roller is being sold as a fiber animal only. He is sterile at the moment, and more than likely will be for the rest of his life. Full Peruvian - This is the chance for the discerning buyer to acquire one of the finest suri females in the country, one of the last and probably the finest full Accoyo Ramilo daughter and the only full Accoyo Ramilo daughter currently on the market. She is a wonderful white female, conformationally perfect and with great coverage and wonderful fleece. Fineness, density and luster are textbook-like. Ria is one of the very last offspring born to the famous Ramilo who needs no introduction. From her dam's side, Ria is a sister of the top notch herdsires Lawman and Gold Rush. Ria is one of the best and most exceptional suris in the US and her crias are just as exceptional. She has had 3 crias to date, 2 with High Roller, a full Accoyo Jackpot son. The first one was a female who became a show winner, the 2nd one was a stunning little multi boy who completed a successful show carreer. 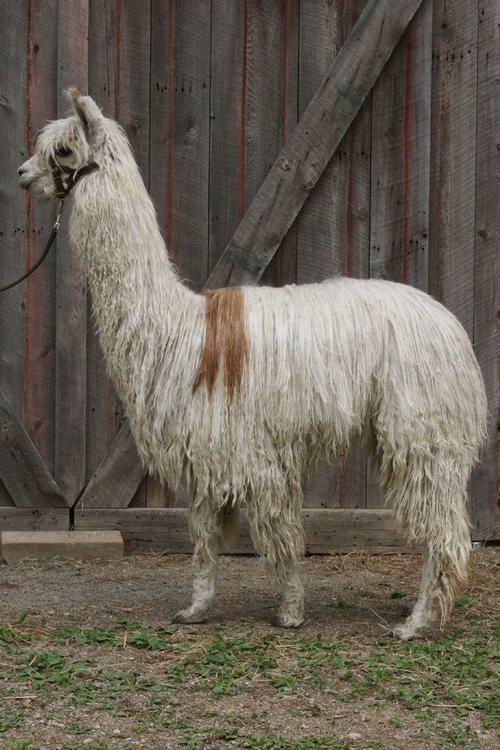 Ria's last cria is a very beautiful female sired by Rockstar. 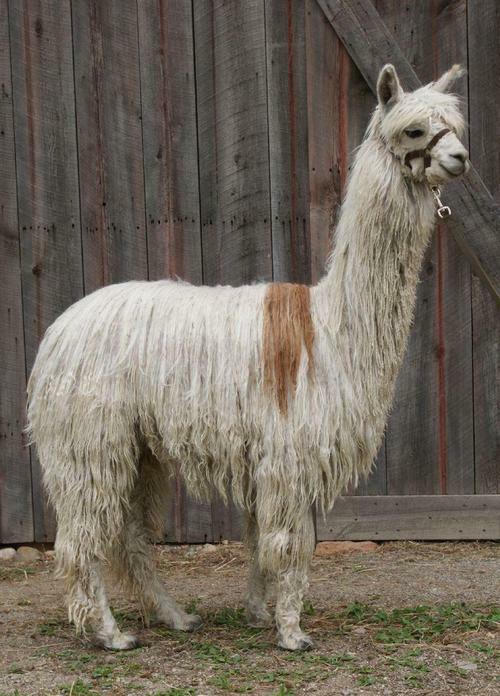 Manchado (aka Spot) has great conformation, a beautiful Suri head, wonderful fleece and TONS of luster. He is white with a large brown spot on his back and several brown markings over his body. 'Spot' has Jackpot genetics from his Sires side and Ramilo from his Dams. His sire Jax Accoyo High Roller is one of the darkest full Accoyo suri herdsire in the country. High Roller's blanket is uniformly medium fawn with parts of his neck and his top knot being dark fawn. 'Spot’s' dam, Jax Accoyo Ria, is a wonderful white female, with great coverage and wonderful fleece. Her fineness, density and luster are textbook-like. Ria is one of the very last offspring born to the famous Ramilo who needs no introduction. From her dam's side, Ria is a sister of the top notch herdsires Lawman and Gold Rush. We are in the process of downsizing due to health reasons...this guy needs a good home where he can pass on his genetics. Call Linda at 989-550-7629 for more information.